It’s a shame businesses so often line up against better bike infrastructure. Believing that business depends on customers who drive, local store owners have opposed bike improvements in Philadelphia, Memphis and many other cities. 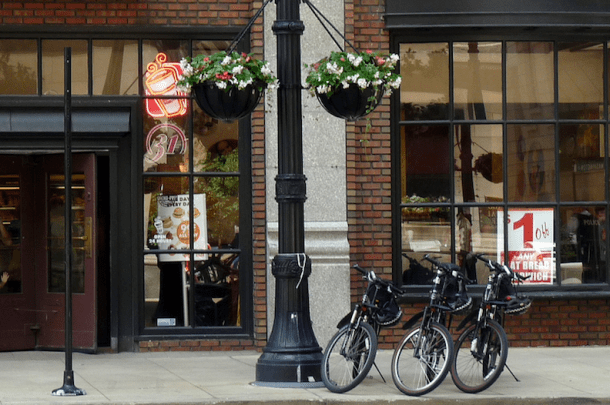 Based on data from more than 1,000 survey respondents, Alison Lee found that, even though cyclists spend less on average, improvements to urban bicycle networks still bring retail benefits. Lee suggests that by replacing one car parking space with six bicycle parking facilities, the lower average spend of a cyclist could be multiplied, offering improved revenue opportunities for nearby businesses. Of course, this simple mathematical equation, whilst theoretically true, assumes enough demand to keep the bicycle parking facilities adequately full. Despite this, Lee’s findings are remarkably similar to a study from the Dutch city of Utrecht which found that whilst bicycle-based consumers spend less per transaction, they make more visits and spend the most collectively. This isn’t the only connection – a German study found similar results, calling cyclists ‘better customers’ due to them making eleven trips per month compared to seven for motorists. And the Swiss are in on it too, where research into parking space profitability found that each square metre of bicycle parking generated €7500 compared to €6625 for cars. This seems to confirm basic logic – devoid of any significant storage space, cyclists are likely to spend less and shop more. You can also add to Peach’s list a study of Bloor Street in Toronto [PDF], which found that only 10 percent of customers arrived by car, and that those who biked or walked came more frequently and spent more money than driving customers. Portland businesses, perhaps due to their longer history with bike infrastructure, seem to have figured this out for themselves. There, overwhelming demand for on-street bike parking among businesses means the city has a long waiting list. Elsewhere on the Network today: The Commuter Page Blog says communities should use transportation demand management to make the most out of their existing transportation systems. Cap’n Transit says too many transportation agencies do not honestly explore the “no-build” option in project assessments. And Rebuilding Place in the Urban Space looks at the housing crisis and sprawl in Phoenix. When I drive, I have no money, so this makes pretty good sense to me. I shop by bike. With my Xtracycle I can bring home five bags of groceries, enough for a family of five for a week. I have also carried irrigation tubing, lawn chairs, a Thanksgiving turkey, and an enormous Kentucky Derby hat on that bike (though not all at the same time.) Last year I did most of my Christmas shopping with my regular bike outfitted with two panniers. When a store has bike parking out front, I know they are bike-friendly and it makes me more likely to patronize them. Same is true for restaurants. I wish the Whole Foods closest to my house didn’t even have a car parking lot. At least half the customers shopping there buy less than 10 items (which can easily fit into one bike pannier) and the congestion the cars cause trying to get into the small parking lot at times makes the whole block miserably impassable. I’m not sure the point of buying organic food if driving to get it damages your health by poisoning the air you breathe? i also love getting my food at either whole foods or trader joes. the beauty in NYC is that, i simply haul my stuff on the subway from my commute home. no car needed. Did you ever hear about how seniors buy at the supermarts in FLA? Seems they come in every day and buy one or two things; then take forever getting their money. You never want to get on line behind them. You’ll never get out. Bikers spend less but shop more often, and that makes them better customers, you say. I bet senior bikers are real premium customers. Senior bikers in the shop would mean that the streets are safe for cycling for 8-to-80, wouldn’t it? Awesome! That would also mean that a lot of people might cycle there, instead of going by car to a huge mall in the outskirts of the town. Thus, cycling is good for business. Q.E.D. i don’t like shopping at places without a bike rack,or something to lock a bike to. weather on my bike or not. In a way this is chicken/egg first stuff. Bike parking structures and space encourage cycling for a purpose, but without this, only the hardy would ride. Example: The Serra Mesa branch library here in San Diego has bike parking racks. Although its only frontage is on Aero Drive, your basic six lane high speed arterial (with bike lanes, I might add), and is surrounded by industrial parklands and a general aviation airport, I’m not the only one who rides there. This, despite the nearest housing concentration being about a mile and a half away. Bicyclists don’t buy so much per trip because they can only carry so much on their bikes. But they do visit each store more often, e.g. buying fresh food every day or two instead of those giant packs of frozen food at Costco.